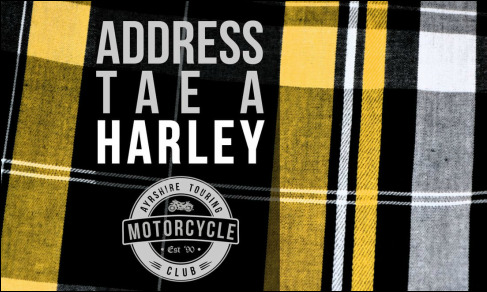 All recent and past events, trips, runs and social nights from Ayrshire Touring Motorcycle Club. Please note these are a list of runs, ride outs and events which were official organised by or attended by ATMCC. 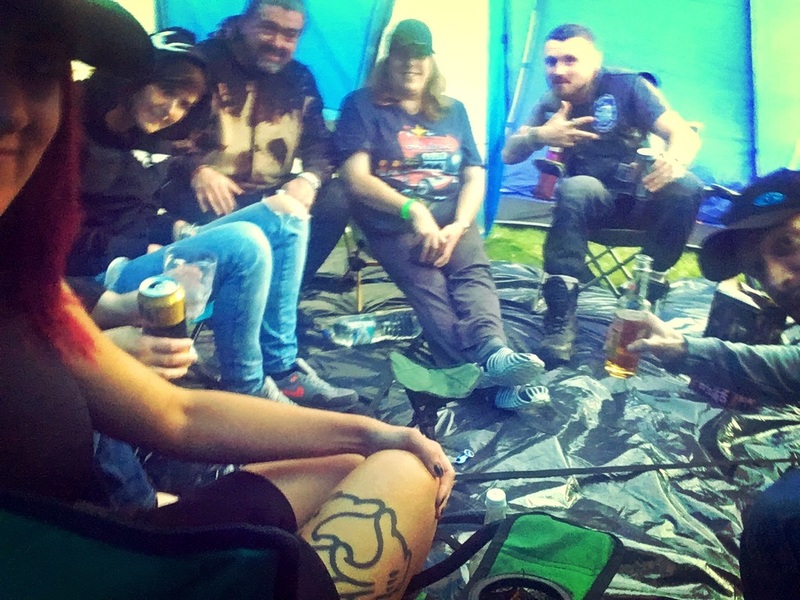 We attend plenty of other events, motorcycle festivals, runs organised by other clubs etc. 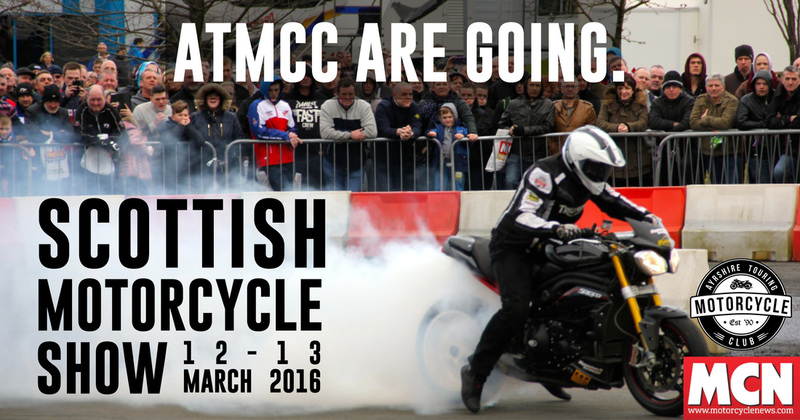 To find out what we are attending or more information on any ATMCC organised events please follow our Facebook page or click here. More info will become available after the European Presentation night. First run of the 2018 season was also a first for one of our members. 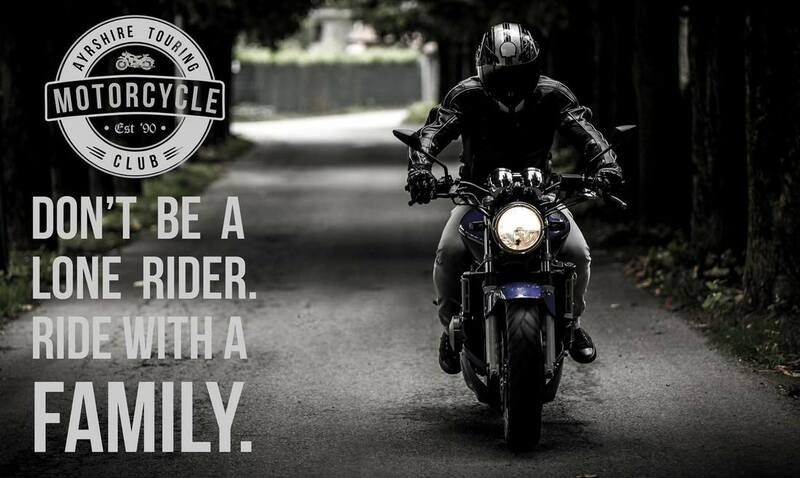 We host regular Sunday Runs where a variety of members attend on various bikes of all makes, models and sizes. 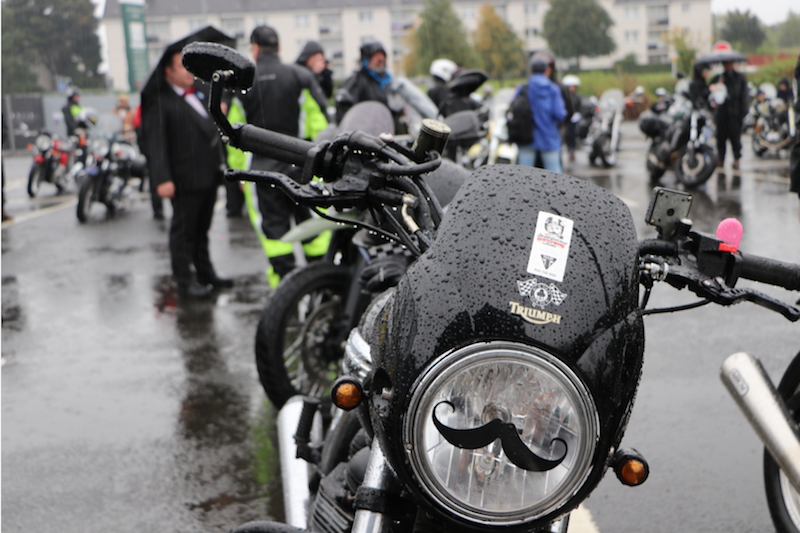 Find out why members of Ayrshire Touring Motorcycle Club are known as "Thick Skinned..."
Some of our members took part in this years DGR event which took place on Sunday 24th September, others rode to and met DGR participants at the Triumph Glasgow Vintage After Party. Altogether our members raised £472. Read our members blog below. 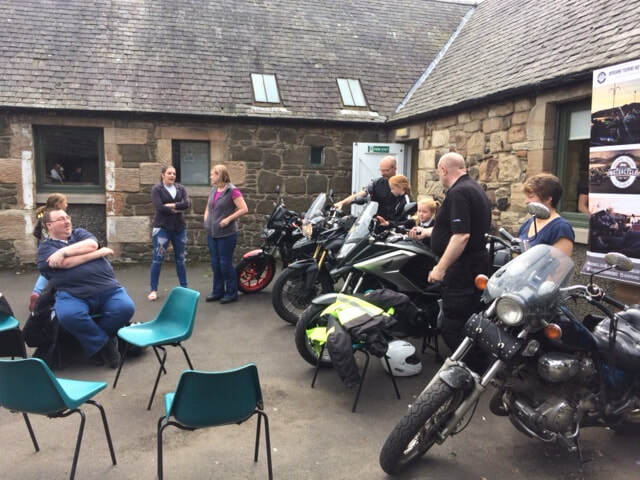 Our venue suppliers, the Dreghorn Community Centre, which is run by North Ayrshire Council, had an Open Day in August, and invited ATMCC along. A selection of our members supported by taking along their bikes, allowing visitors to sit on the bikes, get their photos taken and learn more about the club. A few members opted in for a Sunday run up towards Pitlochery. 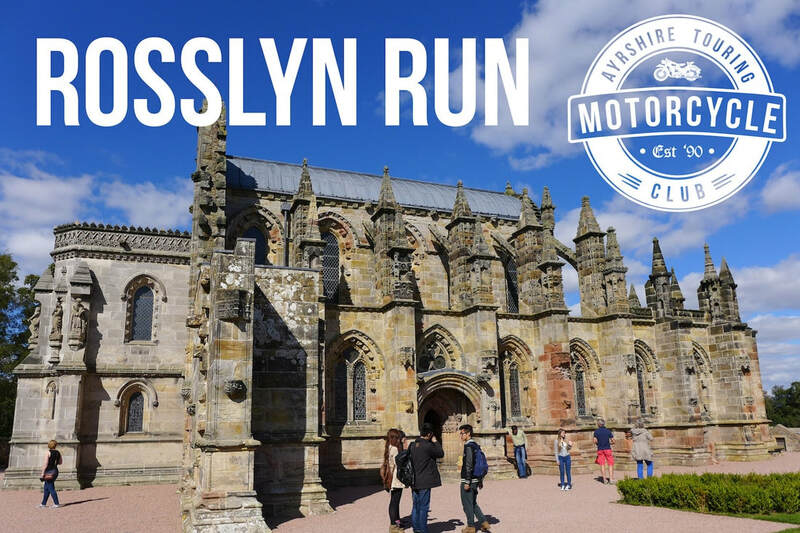 These Sunday / Saturday impromptu runs happen often, so we advise you to join the club, be invited into the Facebook Group, so you can also take part. Some of our members completed the North Coast 500 in July this year. We did it anti-clockwise over 5 days. We all absolutely loved all the dancing, mischief, riding, roads, what they still class as 'roads' and even the falls... Click below for pictures, video and run report still to follow. 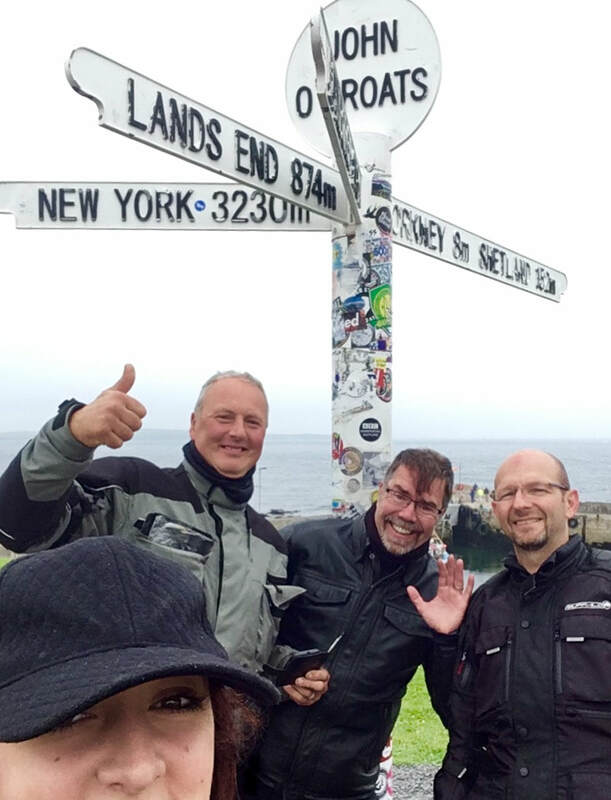 Some of our members embarked on a three week trip around Germany on a selection of differing bikes. Every Winter we host a European Trip night, where members who have participated in a European Trip, can provide a presentation, photos, videos etc to detail their trip. More to come on this trip after this presentation. Off for a run to someplace near, was it a checkpoint, aye but dinnie fear! Pictures you'll no see yet, 'cause aff like a rocket we all set. Kevin, Lindsay, Brian, Mitch, Rachel and me, we behaved like wee bairns, it was plain to see. King of the castle on the climbing frame, Launching Lindsay was the name of the game. We'll no get in there was the challenge cried, not one, not two, but five of us tried. So into the cart we all went, pictures taken checkpoint sent. The sun had set, was it time to retire? We looked to the West, look the sky's on fire! So off we rode, North, East and West, the road to home for sure is best. So 'til the next time, fill your hearts with glee, and join a run with ATMCC. Another great social night recently took place. Hosted on the 5th week when it occurs, we plan nights outs, competition evenings, gigs, dinners and attendance at events. At the end of May we had planned a lazer tag evening at Ayr's LA Bowl although as it was a lovely evening, we decided to take a ride out to St Johns Town of Dairy for dinner. An annual event for the club. 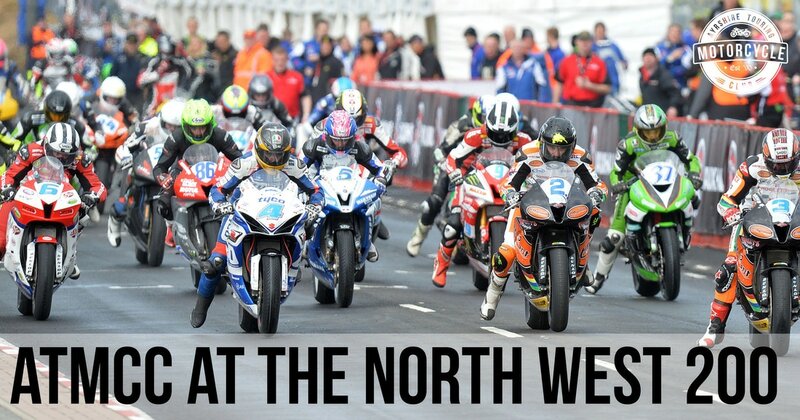 We attend the NW200 every year, with a variety of members for a varied amount of dates. We stayed in a gorgeous house which we have every year, and this year we fully booked it. One of our members volunteered to work at this notorious road race this year, read the full run report here. 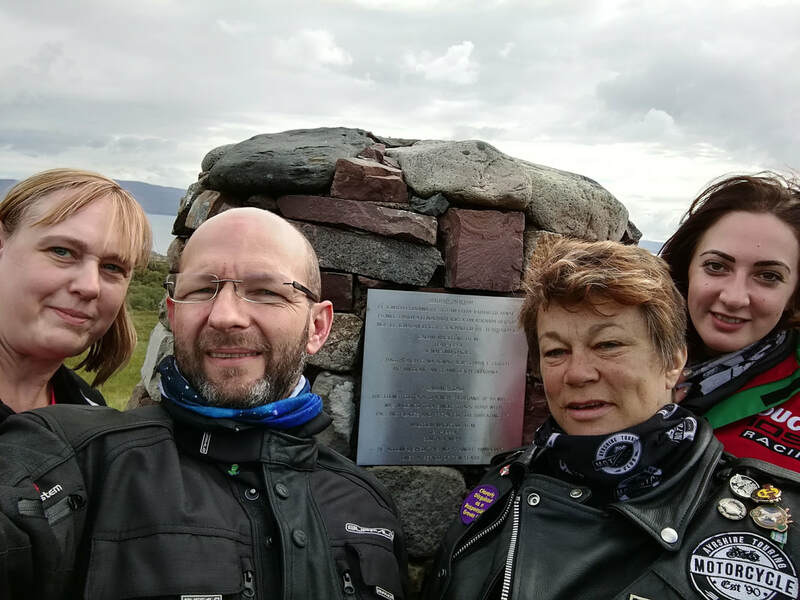 This year some of our members attended the Bikes on the Beach Rally which was a ride in organised via Facebook by Scotorian Biker. Over 300 bikes were in attendance and was a great day had by all. 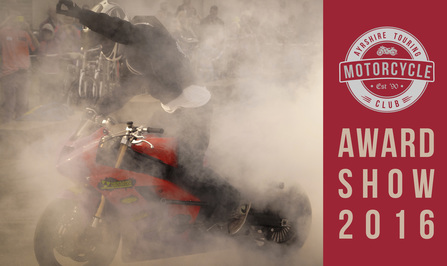 Every year we attend the Scottish Motorcycle Show and this year was no different. 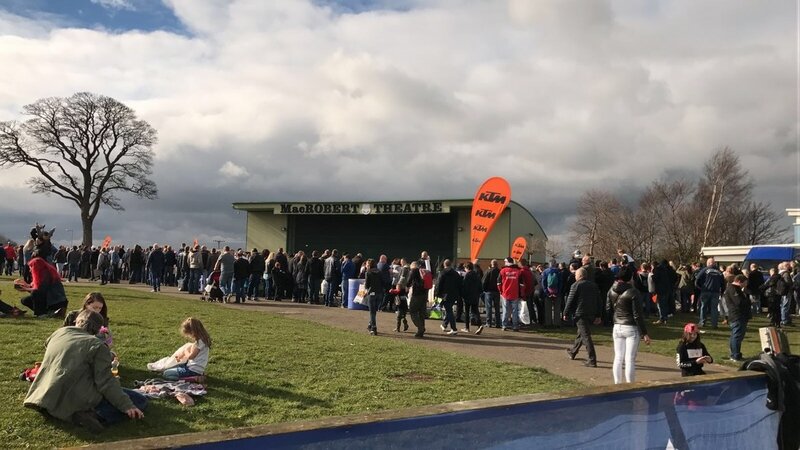 With some of our members working at the event, visiting the show, shopping, and taking part in the Kevin Carmichael Stunt Show, overall a great attendance from ATMCC over both days. At one of our meetings in January, we collected and discussed the nominations for the 2017 Checkpoint Charlie List. As discussed, one of our members has decided to create a map from clues depicting particular destinations / events / cafes and visitor spots. If you are interested in joining the club or would like to take part in this competitive challenge, please click here for more information. 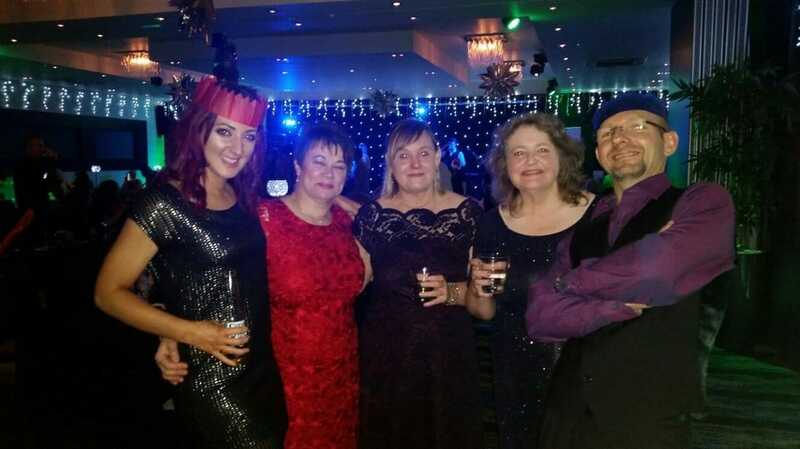 We all loved our Christmas Party Night at the Carlton Hotel at the start of December and it was great to see so many taking part and dressing up for our Christmas Jumper/Movie Night at the end of the month. Miracle on 34th Street was projected on the walls of the clubhouse and we cried at the sad bits (rough tough bikers) and laughed throughout the evening. 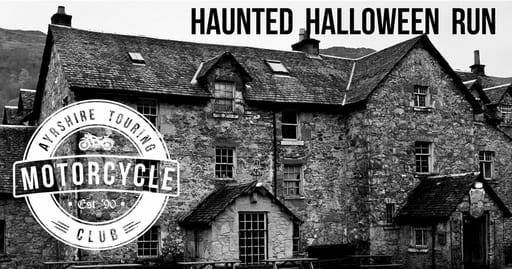 We all had an absolute blast and would thoroughly recommend the Drovers Inn, not just for spooky evenings and ghastly mornings. The meal was delicious with good sized portions, drinks are reasonably priced and the band were out of this world. We stayed at Ardlui Campsite in a lodge/ caravan which was only 2 miles from the Drovers with modern decor throughout, good space and clean. Some of us also stayed in the Ardlui hotel where we had a 5star breakfast - compliments all round. 10/10 Weekend. British Motorcycle Federation yet again organised a wonderful rally and bike show for all to attend. 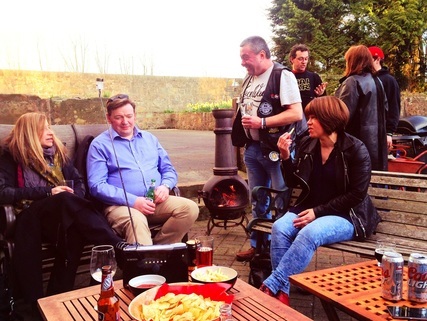 The weekend long festival was based within the grounds of the Stair Arms Hotel, Midlothian with a ride out scheduled on the Saturday to the National Museum of Flight. It was a Girls Weekend for us, as most of our female members attended. 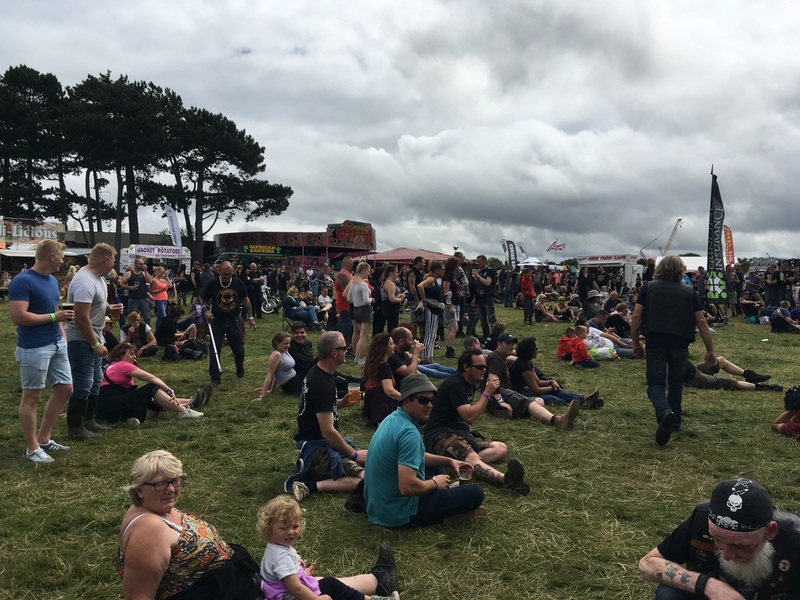 Click the button above to take you to the Rock and Bike Fest trip photos, where some of our members took the long road to Derby for the annual camping extravaganza filled with tribute acts to some of the greatest rock bands of all time, and winning bikes from custom shows. Ride to Work Bike Week was 20-26 June 2016. During this week ATMCC and motorbike and scooter riders around the world showed that life would be better if more people rode motorcycles and scooters every day, with time saved, congestion lessened and travel costs reduced. We had great fun taking part, even though we ride to work anyway. 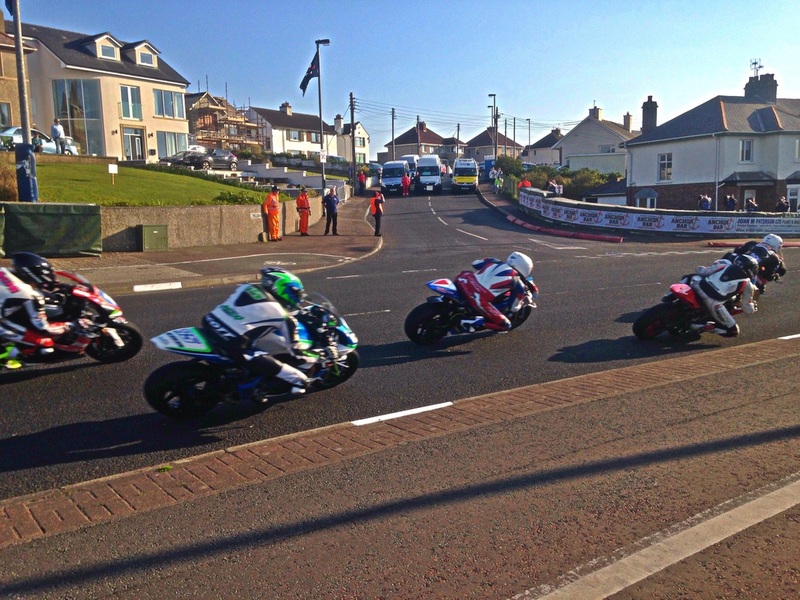 We headed to the North West 200 on Tuesday 10 May and rode back on Sunday 15 May from Cairnryan to Larne. 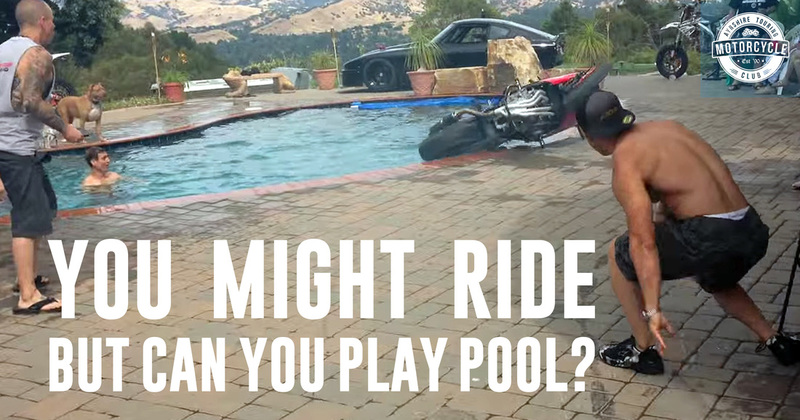 We hired the same house as previous years due to it's great location and ample motorcycle parking. 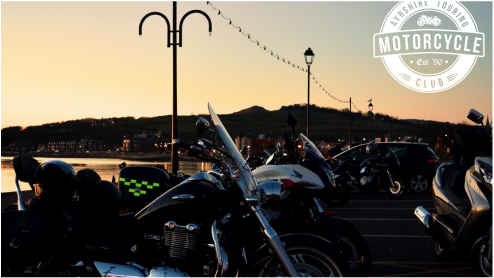 ATMCC saw the sun so we donned our skid lids and abandoned a meeting, for the bright lights and fish suppers in Largs. 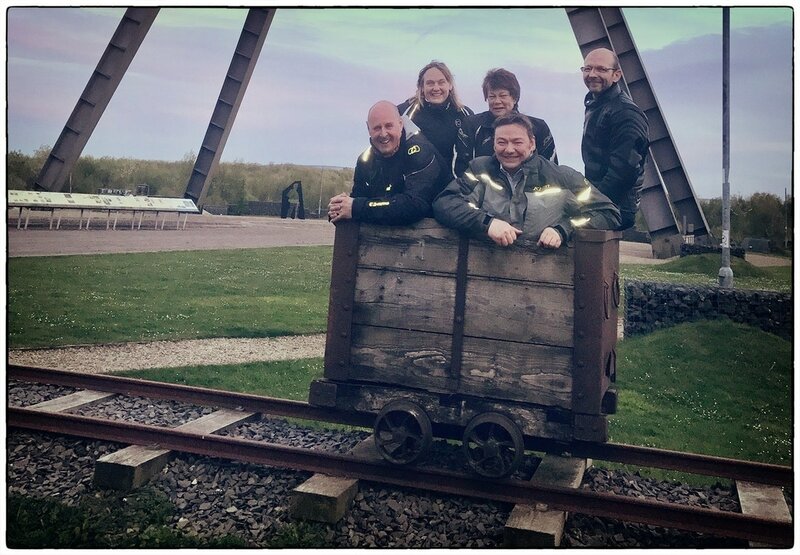 When we scattered out of Townend Community Centre, a few members took alternate routes and went for a coastal tour. A78 or not, we all got there in one piece. By the time we all got home in the back hours of 10pm, we all pledged allegiance to our heated grips. As March had a 5th Wednesday, we embarked on a regular Social Night. 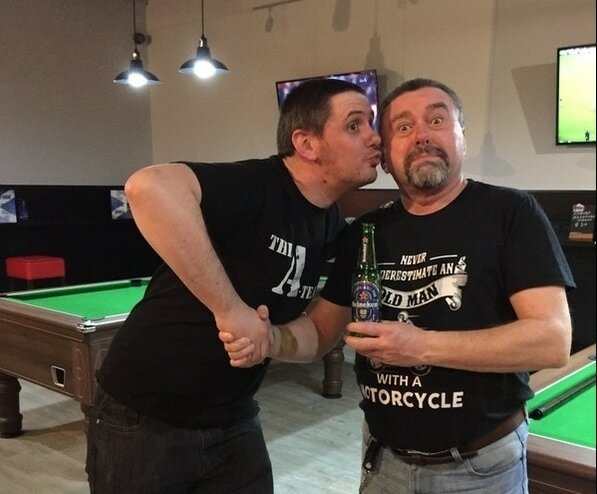 This time we hosted a pool competition at 8 Ball Pool Hall in Ayr. New member Frank took a fast lead to the winners podium 1st place spot, while Maurice and Naomi were close runners up. 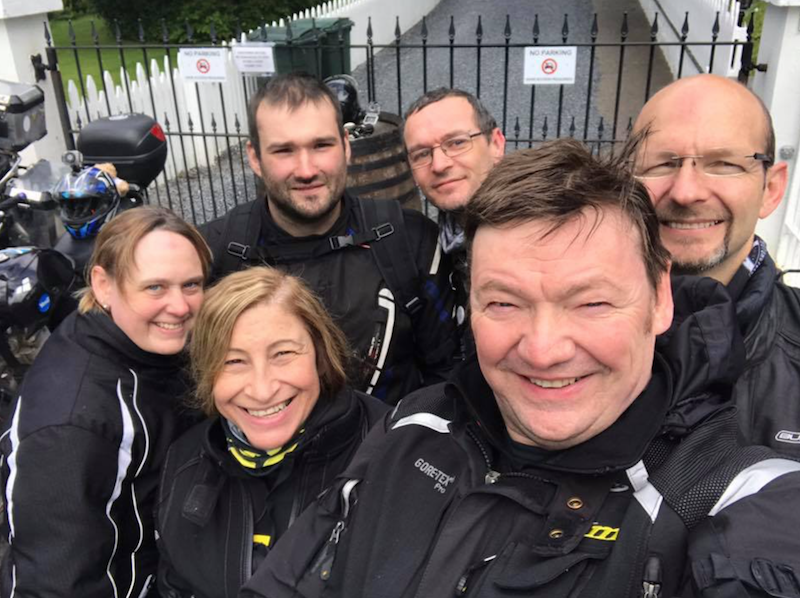 7 ATMCC members braved the wind and rain over the weekend to gather some checkpoints, ride some new roads, travel through some passes and “send it” round some corners. An impromptu Saturday Run, which has now been renamed: The Da Vinci Code Run. This run was nominated by one of our members, and as mother member knew these roads better, she decided to lead it. 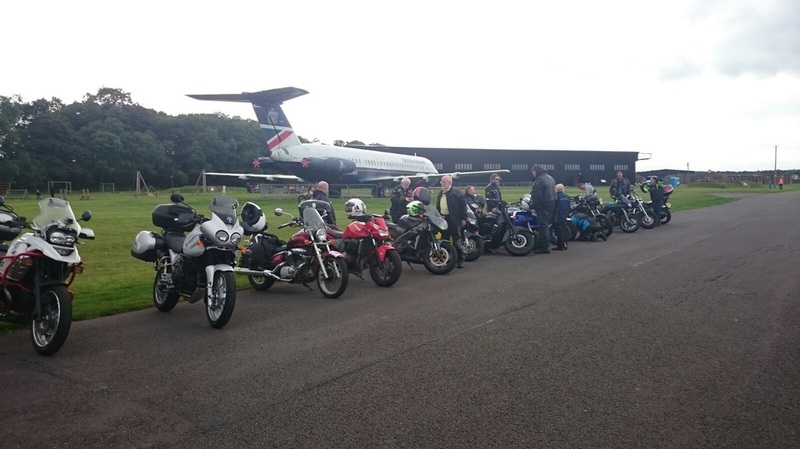 Another great day had by all, it stayed dry and a selection of members on various bikes took part. 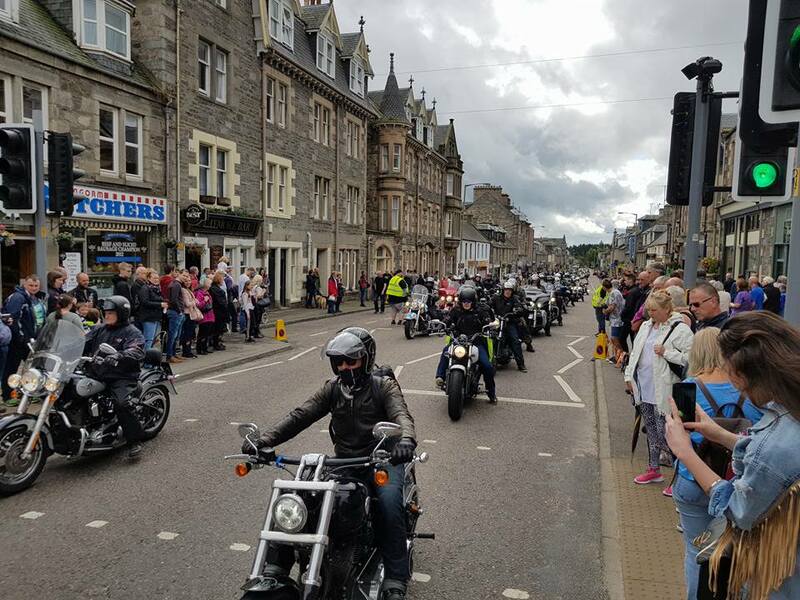 Every year we attend Thunder In The Glens over the full weekend, with some members coming for one day, two, three or four. We usually camp, sharing as many large tents as possible. It's always an eventful weekend, with plenty of bands, music, bikes and dancing. The plan was to end up in Raasay…… no seriously that was the whole plan. I thought to myself, "It’s too short notice for anyone, but I’ll put it out there anyway." 2 hours later we were 3 strong and I realized the non-existent existing plan wasn’t going to cut it. 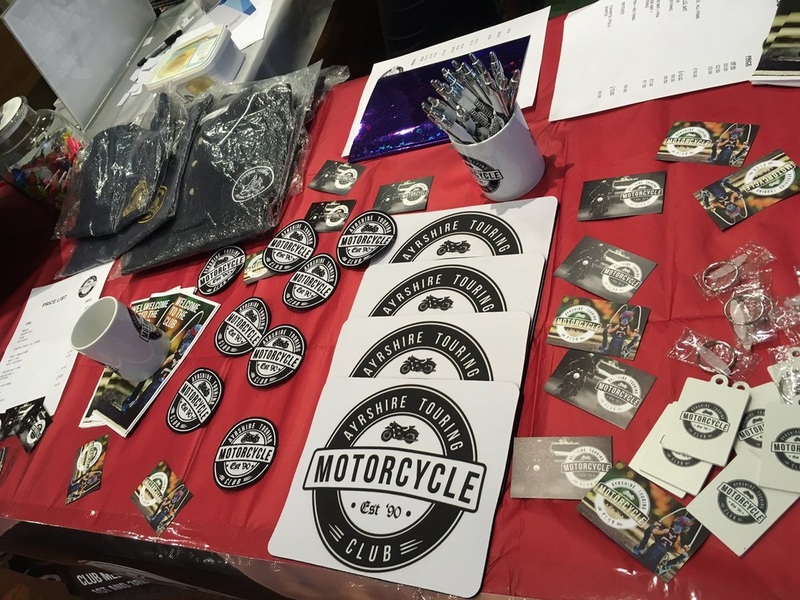 Every year we take a stand at the Scottish Classic Motorcycle Show at Ayr Racecourse, with the aim of promoting the club, increasing membership, supporting their show and raising money for Charity. 2017 was no exception, with success from all objectives. 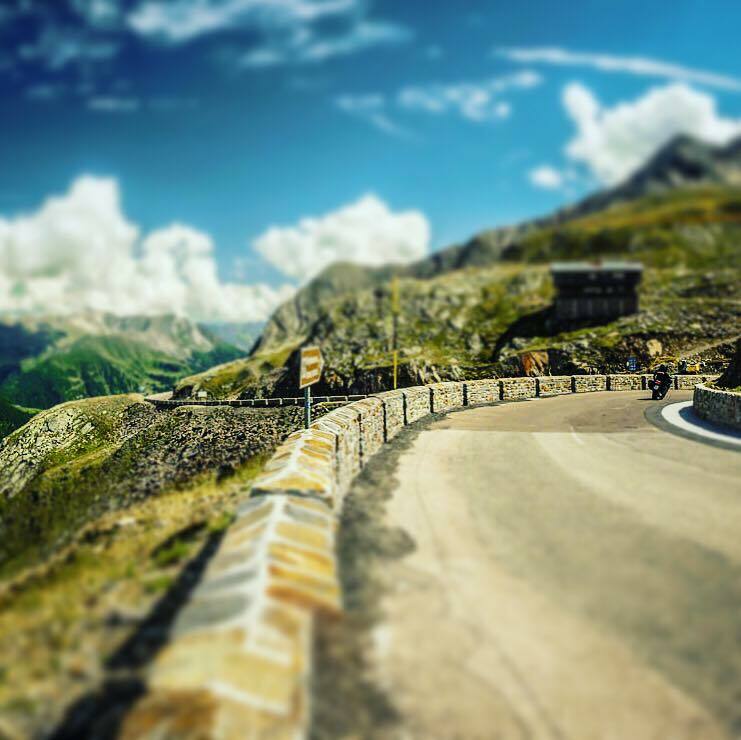 The Italian roads, ice-cream, wine, pizza and even more roads. Every Winter we host a European Trip night, where members who have participated in a European Trip, can provide a presentation, photos, videos etc to detail their trip. More to come on this trip after this presentation. 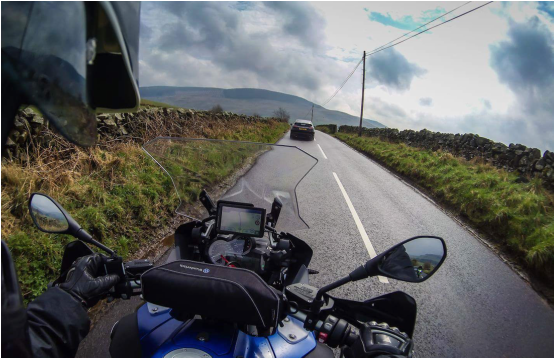 We set off on Sunday 2nd April for a tour of the Lake District. Crayons had come up with a better route than Gilly so I muttered under my breath and said we should use that one. Click here to read the full report and see photographs. Took place on 15 March and the agenda items discussed included the club finances, 2017 fundraising, group chats, Committee roles and job descriptions. All Committee Members including Chairman, Treasurer, Secretary, Digital Marketing and Events Co-ordinator were re-elected and we created and filled two new roles: Fundraising C-Ordinator and Events Assistant. Another great social night took place on Tuesday 28th March. Hosted at Sports Bar in Irvine, it all went to pot very quickly! To keep up with traditions, the Chairman didn't win anything and was balled out by Dreamweaver in the first round. Congratulations to Southpark who won overall and thanked Gilly with a gentle peck on the cheek and a very manly handshake. Every year we host a Burns Night and 2017 was no different. With the best in tartan outfits, spicy haggis for dinner and the possibility of a wee nip if your not driving... How could we refuse? 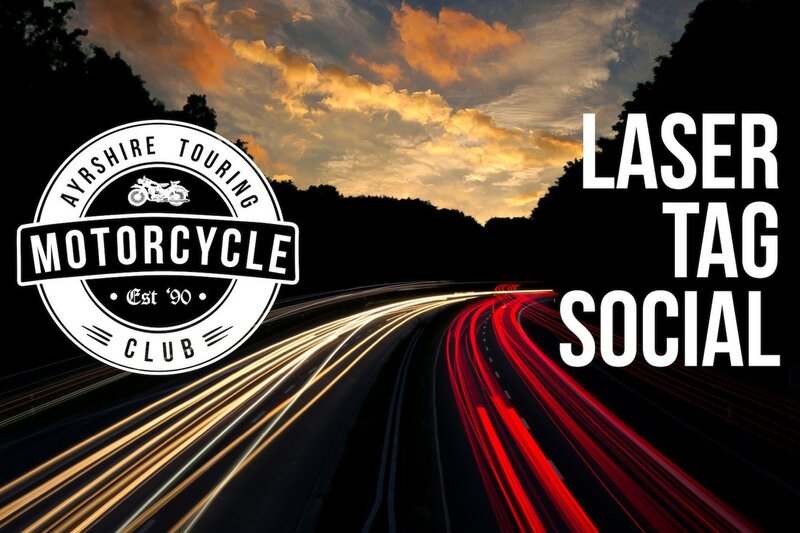 If you are considering joining the club, these social events are an ideal way to meet everyone and kick start the year with some great laughs and start planning your routes for 2017. 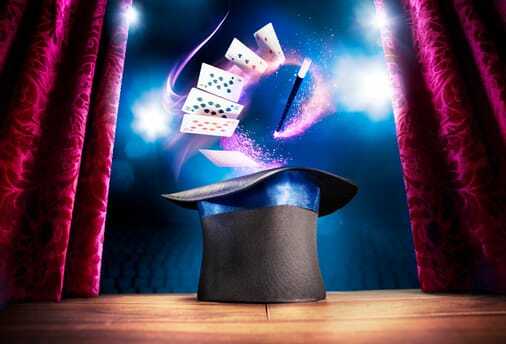 Scott’s Magic Show and Quiz Night was held on Wednesday 2nd November at Dreghorn Community Centre. We raised £176 for Cancer Research with members bringing friends and family and donating great prizes (mainly booze). A wonderful night for a great cause and thanks to all for the support. 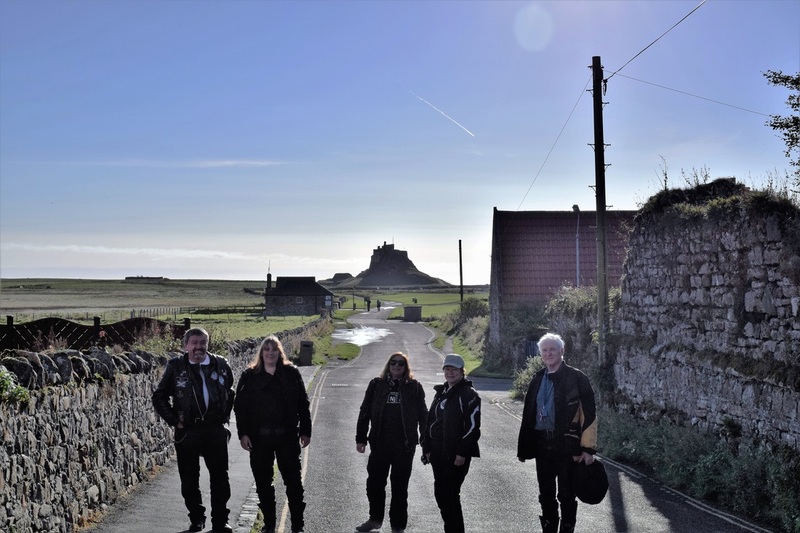 For the September weekend we planned a run to the Holy Island of Lindisfarne, Northumberland. The luxury glamping yurts filled up fast and the weekend was full of laughter, great food, even better weather with some very interesting roads and trips (falls). 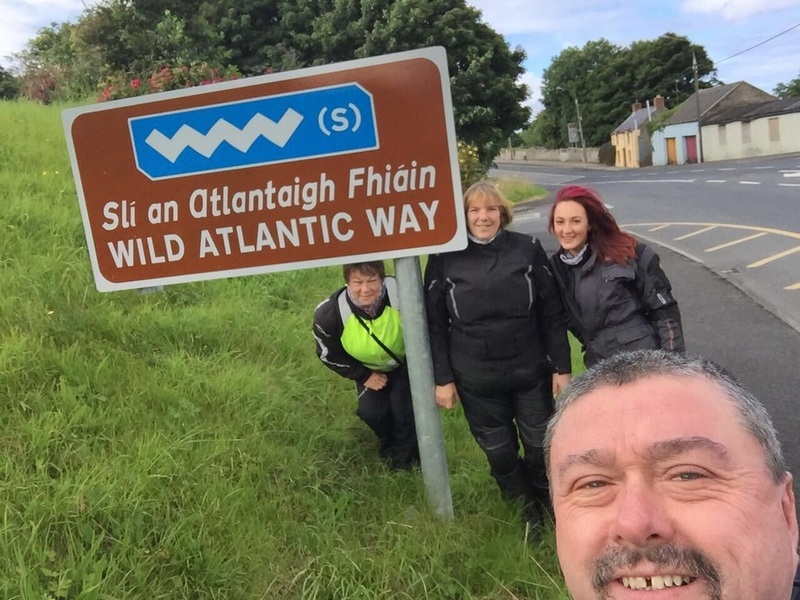 A group of ATMCC members decided to take on the challenge of riding over to Northern Ireland, riding round the Wild Atlantic Way anticlockwise, and finish with a few beer in Dublin. The whole trip lasted 10 days, with 2000 miles and 5 members. 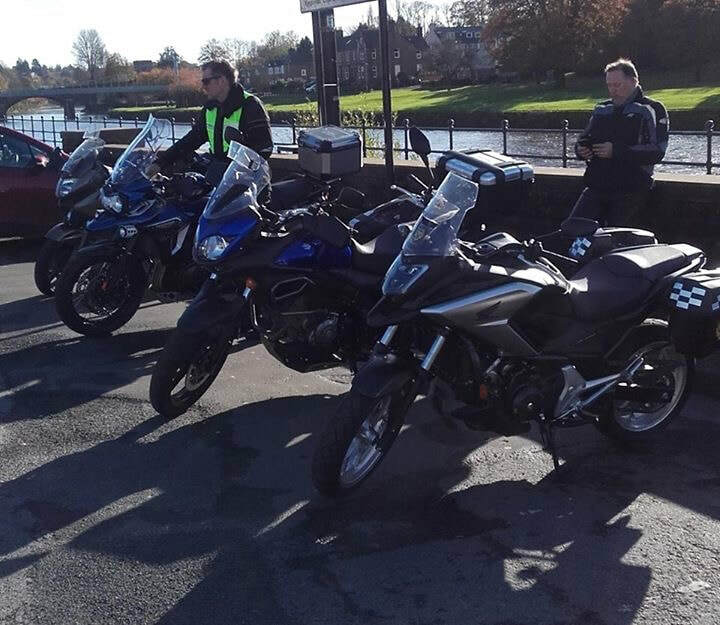 If you would like to come along on rides like this you must join ATMCC. 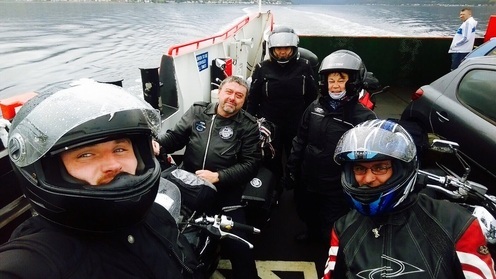 Some of us rode the ferry over to Arran on a sunny Friday night at the end of July, camped overnight at Lochranza before heading over to the Campbeltown peninsula on the Saturday. 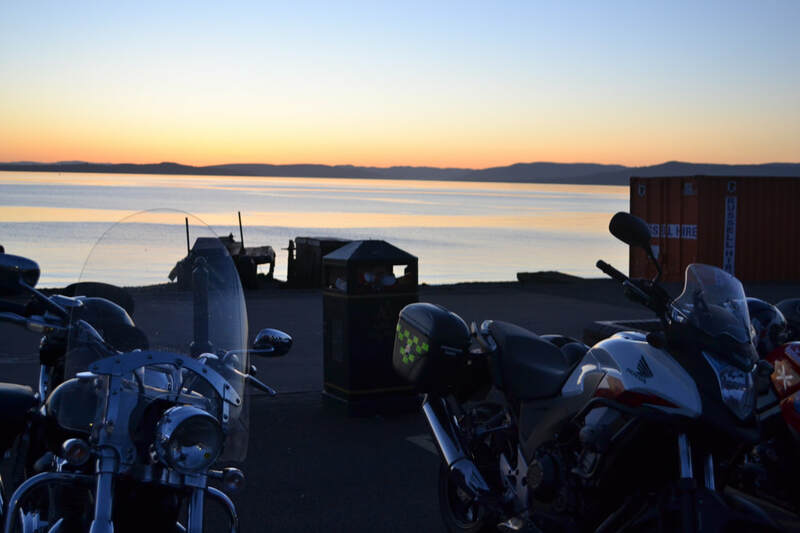 Some of us bagged some checkpoints on the journey home, others camped in Campbeltown for the Saturday evening and enjoyed a few beers before riding home to Ayrshire via Inveraray. 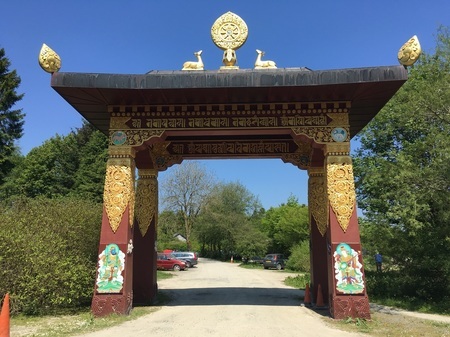 At the start of July one of our long standing members lead a run to Samye Ling Buddhist Temple near Langholm. It was a wonderfully sunny day, great attendance and we also completed the Grey Mares Tail Checkpoint Charlie on the way home. 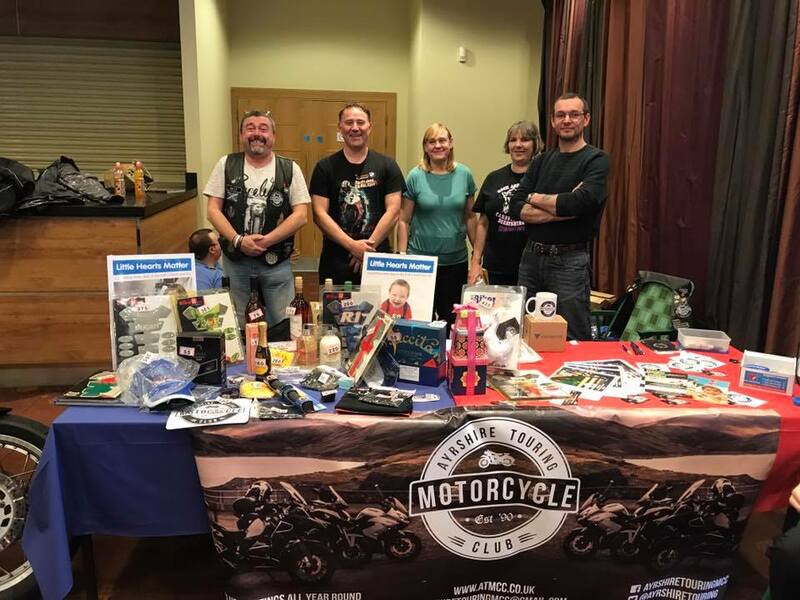 This year we had a stall at the Classic Motorcycle Show, hosted by Ayr Classic Motorcycle Club in Ayr Racecourse on Saturday 11 June. We raised £116 for Cancer Research with a raffle, silent auction and we sold our own merchandise. 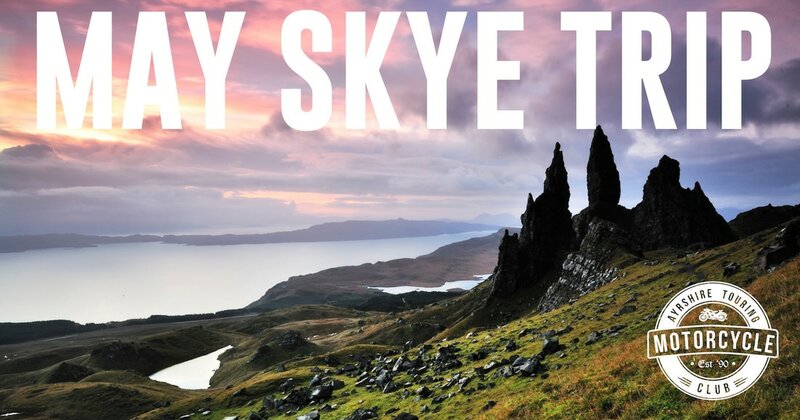 Since the initial Skye weekend trip was postponed, one of our members hosted a party instead. All members were invited, there was an abundance of alcohol, food, sparklers and laughs. The weather was still pretty cold, so even the bikes came into the house to stay warm and dry. Our Opening Season run was a good 'un. We headed round the East Lothian side of the country with a good turn out. The following weekend saw a run titled "Any Port in a Storm" to Port William, and thankfully no storms, just glorious sunshine all day. Leo still wore 37 layers while we had lunch with an interloper from Ayr Classic Motorcycle Club and Elvis. 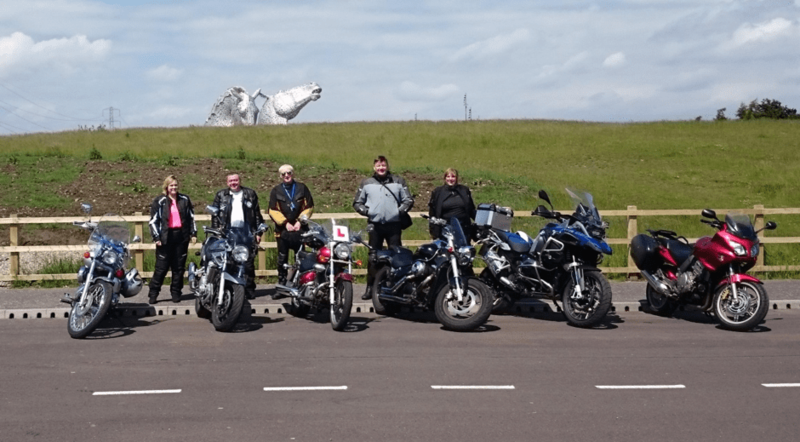 We headed up to this year's Scottish Motorcycle Show at Ingliston, on 13th March and some of us rode up on our bikes and others had a car pool. It was a great day had by all those who attended, with some interesting and rare cars and bikes on show. 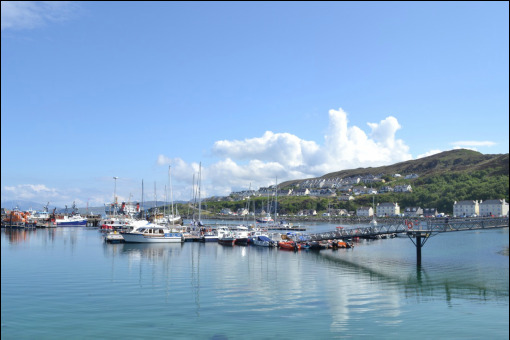 We intially planned a weekend trip to Campbeltown to camp, then onto Arasaig with camping, then upto Skye to stay in a bunkhouse before heading home. Due to weather this trip was split into 2 separate trips, we have had a weekend in Arasaig, and are organising a run to Campbeltown. We had our Annual Awards Show and we hosted it during our Burns Night celebrations at the Cotton Mill, Kilmarnock in January. Congratulations to William for winning Rider of the Year, Stuart for winning European Trip Award, and Greame for winning Member of the Year. Awards are based on nominations and points gathered throughout the year. 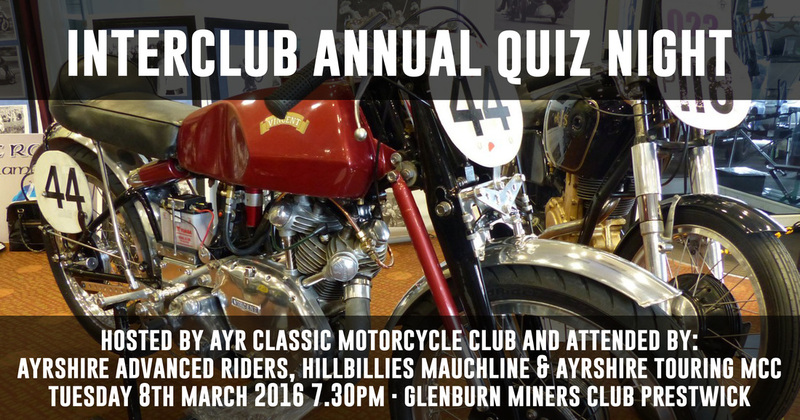 Interclub Quiz Night was hosted this year by Ayr Classic Club at Glenburn Miners Club in Prestwick on Tuesday 8th March. It was well attended by Hillbillies Mauchline, Ayrshire Advanced Riders and ourselves. We did well coming 2nd.... and also 2nd last, Oily Rags from Ayrshire Advanced Riders came 1st, congratulations to all and a great night, as always.